CFN – A shout out for anyone in the area who may want to get turned on to a relatively new sport on the world scene. It was a revelation to me to see the action in the 2012 Women’s Elite Continental Championships in the sport of boxing at the NAV Centre tonight. Who knew that such a world existed? I was drawn to the championship through my connection to the FIT program at NAVFIT and by my interest in what motivates women. What I discovered is that this is an up and coming sport with an incredible amount of dedication driving its movement forward. I had hoped to meet one of the boxers and my wish was fulfilled in the hallway as everyone was leaving I was able to speak to Tiffany Perez. I met her parents as well who are her most ardent supporters. 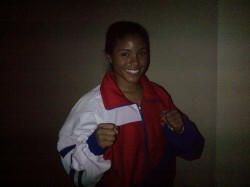 Tiffany Perez fought in the Flyweight/112 lbs (Olympic weight class) on Thursday April 5th, for Puerto Rico. She fought against Erica Cedeno of Ecuador and won. She fought tonight against Erica Matos of Brazil and lost. During Tiffany’s fight I was struck by her single minded determination to succeed and the strength she radiated from her body. It was inspiring to meet a boxer in person because it is a new phenomenon to see women perform in the boxing ring. It is a physical sport, there is no doubt, but all things being equal, what determines the winner is a mental strength that is worthy of study. I wanted to know more about what had driven Tiffany to this sport so she graciously answered my questions. Tiffany told me that her father ran a karate studio and she and her brother both participated in the sport. Her brother got the idea he wanted to try boxing and Tiffany went to watch him and decided that she wanted to try this herself. Her parents were not in favour of this and initially discouraged her as they did not think that this was something a girl should be doing. Tiffany persevered and eventually her parents got behind her. She told me that when she experienced her first hit in the face she was not happy about it and her family was convinced that she would quit, but she overcame that test and became more committed to the sport. 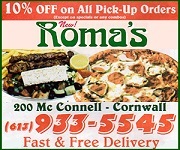 It is a very demanding commitment since, as an amateur, all the expenses are paid for by the goodwill of your family. There is no pot of funding for these women. Originally from Indiana in the United States, Tiffany’s passion for her sport led her to move to Puerto Rico in order to make her place in the world of women’s boxing. There, she stands out as one of two female members of the boxing team. Of course, I rooted for Canada and was pleased to witness four Canadian members of the team fighting tonight: Mandy Bujold, Melissa Guillemette, Sandra Bizier and Mary Spencer. Our Flyweight female boxer Mandy Bujold lost tonight in her fight against Marlen Esparza of the US. Guillemette and Bizier also lost their fights, but Mary Spencer beat her opponent from the Dominican Republic. She was awesome! At 75 kg she is a formidable fighter.